Highly pigmented, water-dilutable wood stain for exterior use. Selected noble shades of grey give, from the very beginning, the impression of a naturally and evenly greyed surface, as otherwise may be generated in the nature only after many years in favourable climatic conditions. Preferred fields of application are wooden facades, which are intended to show a natural appearance. Capadur GreyWood is also suitable for fences, balcony balustrades, window shutters, gates and other wooden parts of unstable shape or with limited stability, but also for dimensionally stable construction elements like windows and outer doors. Only for exterior use! (The interior surfaces of outer windows and doors belong to the exterior surfaces.) 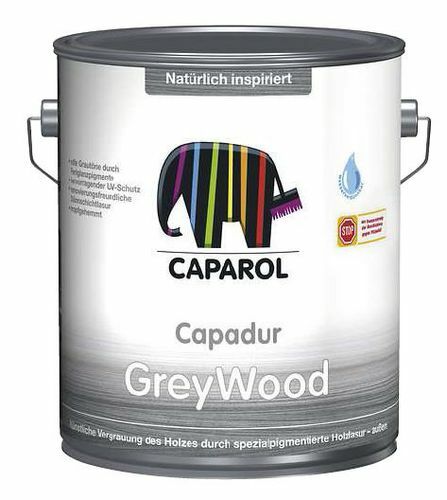 Capadur GreyWood is provided with a preservative against deterioration in the coating film due to algal and fungal attack (fungi/mildew/mould growth). The film preserving agent delays infestation. Depending on biological exposure/contamination, on extremely stressed wooden parts, e.g. in the area of flat roof soffits or on board-shaped wood derivatives (e.g. boards of maritime-pine), the attack may occur again, even before normal warranty time limit has ended. Do not apply on wood with permanent contact to the ground and moisture/water.